The illustrator and I have been on a huge hummus kick lately. I guess since the weather was so warm, we were looking for lite fresh meals. I was making dinner the other night when the illustrator asked if I thought it would be good to add sauteed onions to hummus. I happened to still have some chickpeas in the fridge, so I went to work on it. It was a success! The onions add a slight sweet flavor to it. We would say that sauteed onions was a great addition to hummus! Cook onions and garlic in a sautee pan. I do this with a little water or broth and just keep an eye on it until they are golden brown (add more liquid as needed). Put all the ingredients in the food processor. Blend to desired consistency. Add some vegetable broth if needed to get it to the consistency you like. Refrigerate for an hour or overnight to let the flavors come together. 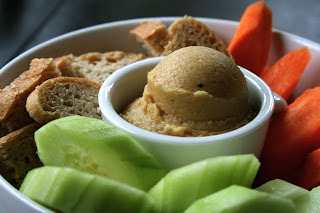 I'm always on a hummus kick, haha :-D LOVE IT!!! I'm saving this recipe for sure!!! It sounds amazing and I love hummus! Mmm, sauteed hummus sounds perfect. Hummus is such a great snack. How delighful! onions in hummus? great idea! Mini Maple Muffins or Pancakes on the Go!